The Shrine of the Three Kings in Cologne Cathedral. The Shrine of the Three Kings (German Dreikönigsschrein or Der Dreikönigenschrein), Tomb of the Three Kings, or Tomb of the Three Magi is a reliquary traditionally believed to contain the bones of the Biblical Magi, also known as the Three Kings or the Three Wise Men. The shrine is a large gilded and decorated triple sarcophagus placed above and behind the high altar of Cologne Cathedral. 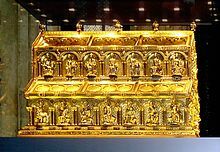 It is considered the high point of Mosan art and the largest reliquary in the western world. The "relics of the Magi" were originally situated at Constantinople, but brought to Milan in an oxcart by Eustorgius I, the city's bishop, to whom they were entrusted by the Emperor Constantine in 314. Eight centuries later in 1164, Holy Roman Emperor Fredrick Barbarossa took the relics of the Magi from the church of Saint Eustorgio in Milan and gave them to the Archbishop of Cologne, Rainald of Dassel. The Three Kings have since attracted a constant stream of pilgrims to Cologne. Parts of the shrine were designed by the famous medieval goldsmith Nicholas of Verdun, who began work on it in 1180 or 1181. It has elaborate gold sculptures of the prophets and apostles, and scenes from the life of Christ. The shrine was completed circa 1225. Around 1199, King Otto gave three golden crowns made for the three wise men as a present to the church of Cologne: "Otto rex coloniensis curiam celebrans tres coronas de auro capitibus trium magorum imposuit"; MGSS 17, 292. Because of the importance of the shrine and the cathedral for the later development of the city, the Coat of Arms of Cologne still shows these three crowns symbolizing the Three Kings. Construction of the present Cologne Cathedral begun in 1248 to house these important relics. The cathedral took 632 years to complete and is now the largest Gothic church in northern Europe. "In a special compartment of the shrine now there showed - along with remains of ancient old rotten or moulded bandages, most likely byssus, besides pieces of aromatic resins and similar substances - numerous bones of three persons, which under the guidance of several present experts could be assembled into nearly complete bodies: the one in his early youth, the second in his early manhood, the third was rather aged. Two coins, bracteates made of silver and only one side stricken, were adjoined; one, probably from the days of Philipps von Heinsberg, displayed a church (See Note), the other showed a cross, accompanied by the sword of jurisdiction, and the crosier (bishop's crook) on either side." The bones were wrapped in white silk and returned to the shrine. The Shrine of the Three Kings is approximately 43 inches (110 cm) wide, 60 inches (153 cm) high, and 87 inches (220 cm) long. It is shaped like a basilica: two sarcophagi stand next to each other, with the third sarcophagus resting on their roof ridges. The ends are completely covered, so there is no space visible between the sarcophagi. The basic structure is made of wood, with gold and silver overlay decorated with filigree, enamel, and over 1000 jewels and beads. The latter include a large number of cameos and intaglio pieces, some pre-Christian. The entire outside of the shrine is covered with an elaborate decorative overlay. There are 74 high relief figures in silver-gilt in all, not counting smaller additional figures in the background decoration. On the sides, images of the prophets decorate the lower part, while images of the apostles and evangelists decorate the upper part. On one end, there are (across the bottom, from left to right) images of the Adoration of the Magi, Mary enthroned with the infant Jesus, and the Baptism of Christ, and above, Christ enthroned at the Last Judgement. The other end shows scenes of the Passion: the scourging of Christ (lower left) and his crucifixion (lower left) with the resurrected Christ above. This end also has a bust of Rainald of Dassel in the center. In the novel Baudolino (2000), Umberto Eco describes the discovery and subsequent donation of the Magi's relics as an elaborate 12th century hoax perpetrated by the title character. In the novel Map of Bones (2005) by James Rollins, the Shrine contains gold in its monatomic state, produced by the Magi, as opposed to holy relics. In the novel "The Bishop and the Three Kings," bishop-detective Father John Blackwood "Blackie" Ryan must solve the mysterious theft of the shrine (Andrew Greeley, 1998). ^ Ciresi, Lisa Victoria (2003, English), A liturgical study of the Shrine of the three kings in Cologne; Department of Art and Archaeology, Princeton University in association with Princeton University Press; ISBN 0691115397, ISBN 0691115389; Princeton, New Jersey, USA; 2003; in re Conference: Objects, images, and the word: art in the service of the liturgy. ^ Kremer, Bruno P. (2017, German); "Wenige Tage nach Weihnachten – Die Heiligen Drei Könige kommen", chapter 2 of Weihnachtsbaum und Osterhase; Springer Verlag GmbH Deutschland, Berlin, Heidelberg; pp. 17-33; ISBN 978-3-662-54768-7 (print), ISBN 978-3-662-54769-4 (online); DOI https://doi.org/10.1007/978-3-662-54769-4_2; 27 September 2017. ^ Boch, Clemens (2012, German); Der Dreikönigenschrein im Kölner Dom. Theologische Aspekte der Darstellung; Universität zu Köln, Kunsthistorisches Institut (KHI); ISBN 9783668048799 (print), ISBN 9783668048782 (ebook); 2012. ^ Leslie, Frank (1872, English), "Tomb of the Three Kings"; Frank Leslie's Pleasant Hours, No. 1, Vol. XII, p. 185, Frank Leslie (publisher), New York, New York, USA; February-July 1872 volume. ^ Salibi, Kamal Suleiman (English, 1980); A History of Arabia; Caravan Books; New York, New York, USA; p. 46; ISBN 9780882060361 (hardcover); 1980. ^ Lowenthal, David (1998); The Heritage Crusade and the Spoils of History, Cambridge University Press, Cambridge, 1998, xvi. ^ "Cologne Cathedral Supposedly has the Bones of the Three Wise Men - Unearthed | Science". www.sciencechannel.com. Retrieved 2017-11-07. ^ Köln, Cologne Digital Medienproduktion GmbH,. "Der Hohe Dom zu Köln - Kathedrale und Weltkulturerbe - Gebaut für Gott und die Menschen". Retrieved 2017-11-07. ^ "Beyond Fiction: unknown facts about Pulp Fiction". The Vintage News. 2017-04-22. Retrieved 2017-11-07. Wikimedia Commons has media related to Shrine of the Three Magi, Cologne. Images of the shrine Requires some navigation: go to "image database", click "search page", type "dreikönigenschrein" in "Freitext" field, and click "Suchen" (search). This page was last edited on 18 March 2019, at 18:58 (UTC).